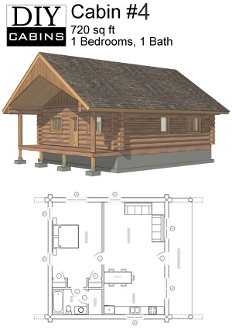 Log Cabin #4 is a 900 sq ft cabin with 1 bedroom and 1 bathroom. This cabin offers a spacious bedroom and sizeable main living room with a large 6'x30' covered entry porch. Designed using 12" logs, this cabin uses an entirely vaulted truss roof for quick construction. All log pages include coordinated log tags to make construction and assembly easier whether you are an experienced log builder or a first time builder.